You have undoubtedly seen a lot of posts from us this summer about the Moonbots competition. That's because we are just so excited (and we just can't hide it? Ok. I'll stop.) by what these aspiring roboticists -- some as young as 9 years old -- have done with their free time this summer. Some learned Solidworks CAD, then put together video tutorials to teach others. Some picked up some serious video editing skills. And all of the teams experimented with designing and programming a robot that could meet set objectives. The teams are performing their final tests via Skype this week. Yep, RIGHT NOW. The pressure is on, with a grand prize of a tour of Lego HQ in Denmark on the line. The coolness of that probably ranks right below a trip to outer space for most kids (and, ahem, some adults). An additional component that teams are judged on (other than completing the lunar Lego objectives with their robot) is the "team documentary" -- where teams summarize what they've learned and how they built their robot in a 3 - 5 minute video. These videos were just submitted this week, and now are available for viewing on a YouTube playlist, on Google Lunar X PRIZE's channel. 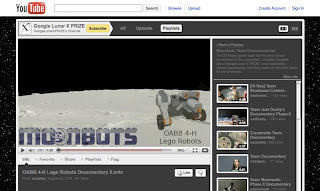 Check out the videos when you have some spare time -- it is amazing what these students have achieved over the course of the competition, and some of the videos are quite entertaining (for example, check out the Team Moonwalk Lego video, or Team Crandroids, who put miniature versions of themselves on the Lego lunar surface). Go forth and enjoy the videos. And please don't forget to leave comments and "likes" on the team videos to show your support for all of their hard work!